Mahesan-naparo devo, mahimno napara stutih. 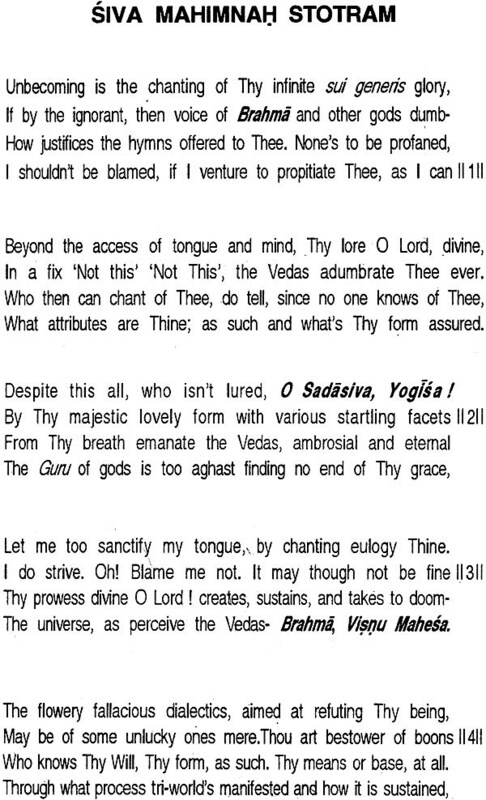 i.e., No god is greater than Shiva and no stotra is more powerful than mahimnah. No rituals like sodasopancara etc are required for its chanting with devotion. 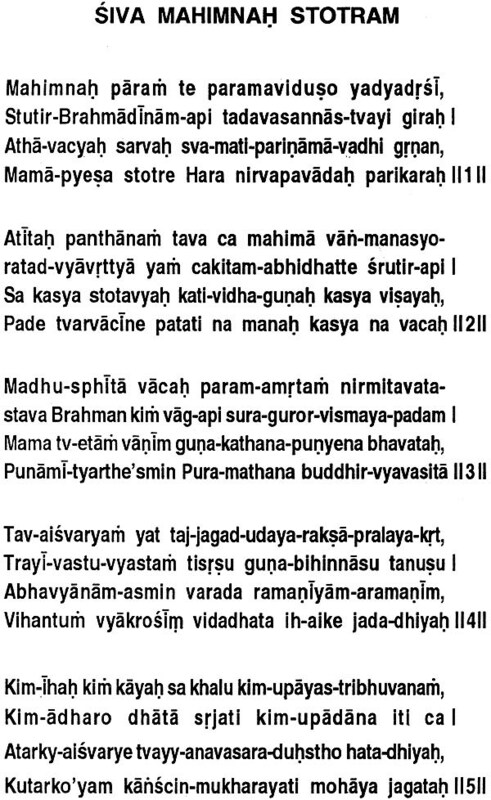 The recitation of the stotra with full devotion bestows the four purasharthas Dharma, Artha, Kama and Moksha. From the modern research point of view nothing can be said authentically about its date and author. On the basis of tradition and the internal evidences. Its authorship has been attributed to the king of Gandharvas ( celestial singers Pushpadanta. 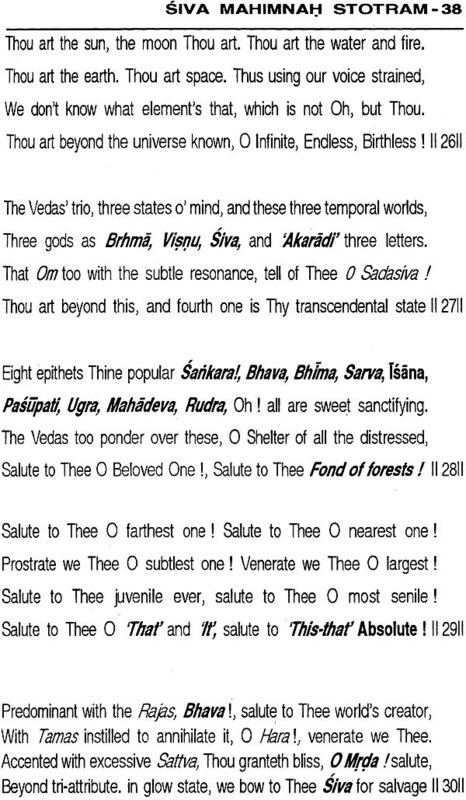 He h=was a devotee of Lord Shiva. Due to some reason he fell a prey to the wrath of Shiva. And to please Him and regain His mercy, he composed this Stotra. 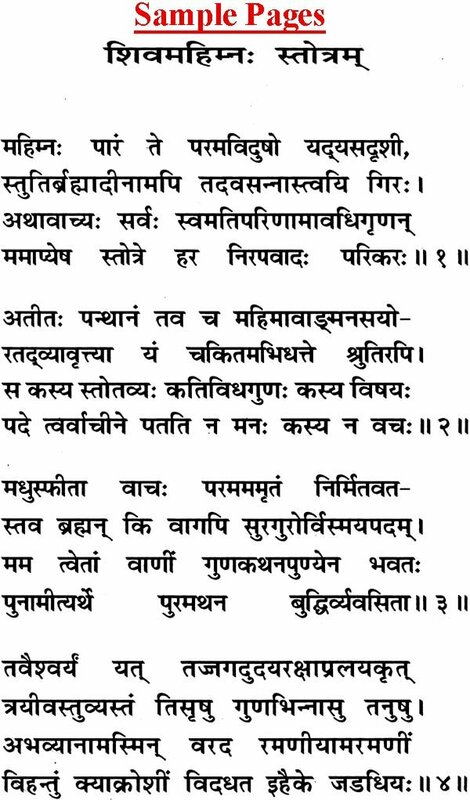 According to the edition of Gita Press, Gorakhpur, Pushpadanta used to steal flowers daily to worship Shiva from the gardent of king, Pramod. Nobody could know as to why the flowers has been lessening day by day. The king thought that the person could not be an ordinary man but some god or a man with divine powers. In order to check it he got the material used for Shiva’s worship like water, flowers, and leaves of Bilva scattered on the way to the garden. As usual when Pushpadanta entered there he could not fly back. Thus being deprived of divine powers, he thought that he had committed some crime or mistake in the worship of Lord Shiva. Suddenly beholding the material Bilvapatra etc around him he immediately realized that it was all due to crossing over that material. Hence, filled with repentance and single minded devotion he started praising Lord Shiva, which enabled him to regain his lost powers. The same praise has come down to be known as Siva Mahimnah Stotram. 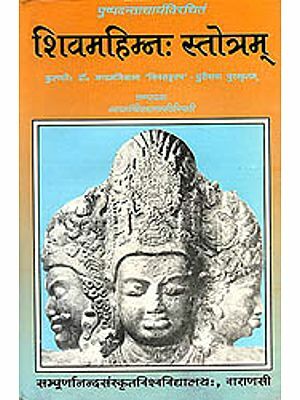 It has been published with Hindi and English translations by many a reputed publishers. 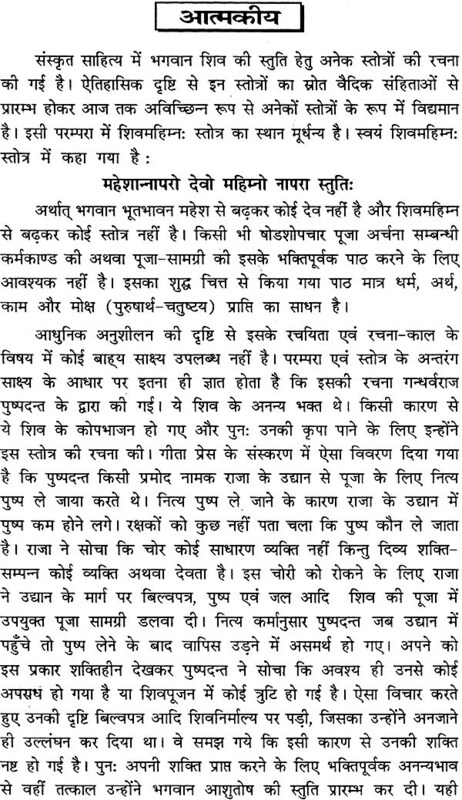 But, its poetic version has been published in Braj Bhasha by Gita Press only. 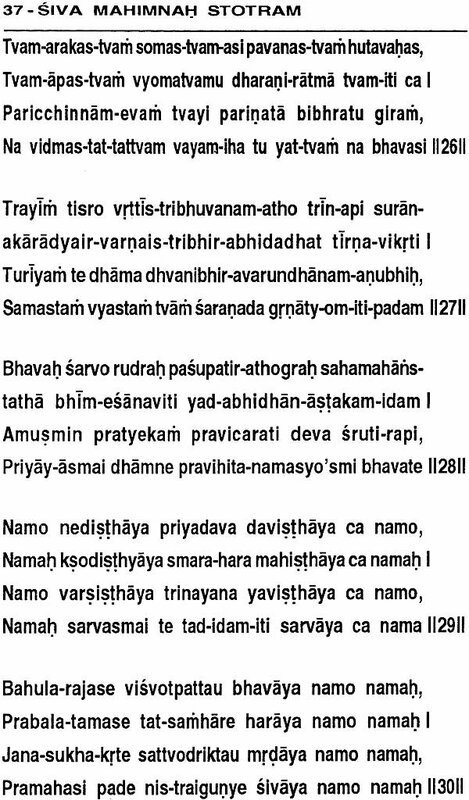 Since Braj Bhasha is no more the lingua franca, I decided to translate it in Khatri Boli. During the process I found two verses very terse for the poetic version. Being disappointed I left the work incomplete. Perhaps Shiva blessed me and I once again decided to complete it. Lo it was complete. After that the idea of rendering its English poetic version came to my mind and I thought to publish it in some it in some magazine. Having gone through all the material it appeared better to published both the versions in the form of a book. Perhaps shiva took pity. 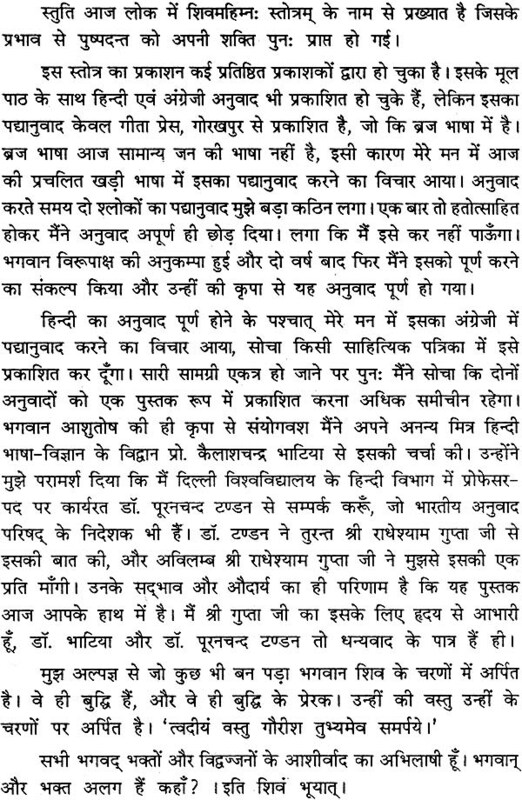 I discussed the matter with my friend Dr. Kailash Chandra Bhatia, an eminent scholar in Hindi Linguistics. He, in turn, advised me to contact Dr. Puran Chand Tandon, director of Bharatiya Anuvad Parishad & professor of Hindi in Delhi University. 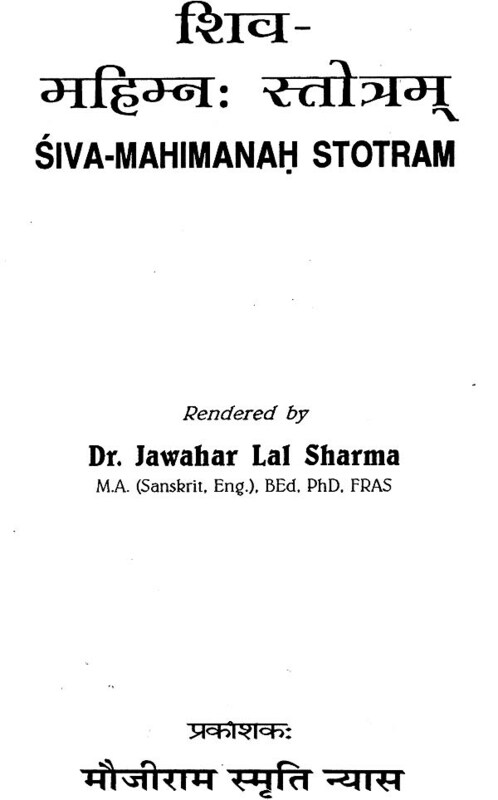 Dr. Tandon referred it to Shri radhey Shyam Gupta, who without any delay asked me to send the manuscript. 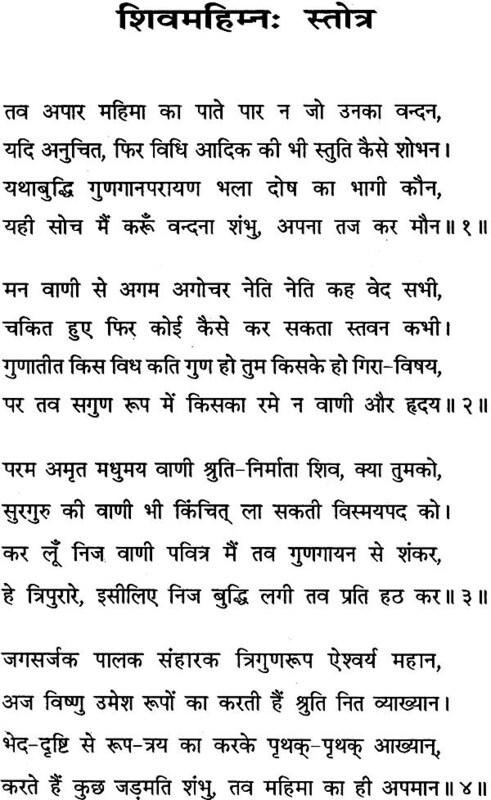 This is all due to the benevolence and philanthropy of shri Radhey Shyam Gupta alone that this book is in your hands. I am no less grateful to Dr. K.C. Bhatia and Dr. P.C. Tandon. Whatever a man of little knowledge like me could do, is offered at the feet of Lord Shiva. He is the mind, and the motivator of mind. Thus it is His thing offered at His feet. “Tavadiyam vastu Gaurisa! Tubhyam eva samarpaye. I long for the belessings of all devotees and learned ones since the God and the Devotees are not two different entities.